Krull! The exciting new video game based on the $25 million fantasy adventure from Columbia Pictures. Krull is a world deep in a far-away galaxy, a culture of myth and magic. The kingdoms of Krull, in the past divided by wars, have united to battle the terrible enemy who seeks to dominate them... the Beast. He is a powerful dark force who has returned from Krull's ancient past, determined to destroy all those who oppose him. 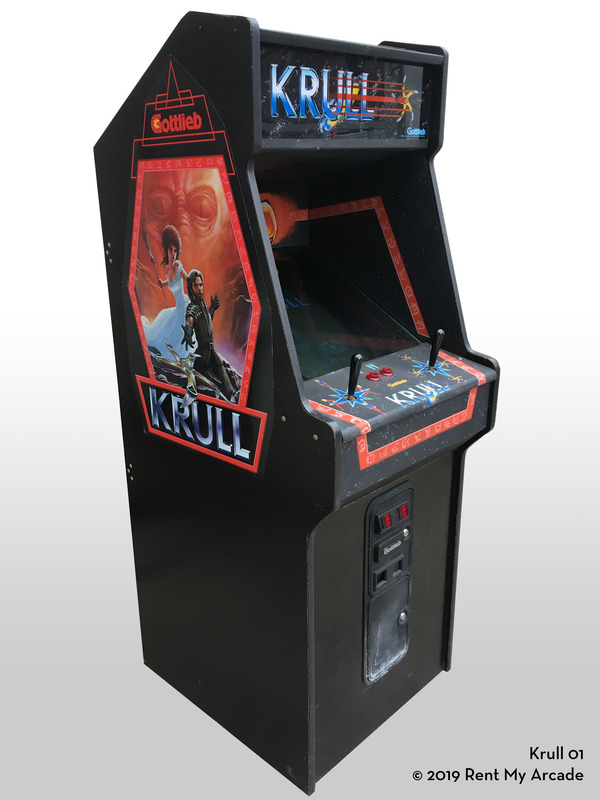 Krull is Gottlieb's first movie-themed video game. Players can relive the movie's thrills in the video world of Krull. Featuring five different and challenging adventurers in one overall game, the player advances through several scenes, battling the Beast and his army. Arm yourself by collecting the five blades of your weapon while dodging the avalanche of boulders. Destroy the evil Slayers with your glaive and rescue your army, who will help you in later screens. Protect your army by placing them in the traveling hexagon that masks the entrance to the Fortress. Only the black walls of the giant hexagon are vulnerable to your assault. Open the black walls with your glaive and prepare to face the Beast. You must now battle the Beast. Avoid the fireballs and defeat him to rescue Princess Lyssa.